Media captionPauline Cafferkey fell ill with Ebola after working in Sierra Leone in 2014. 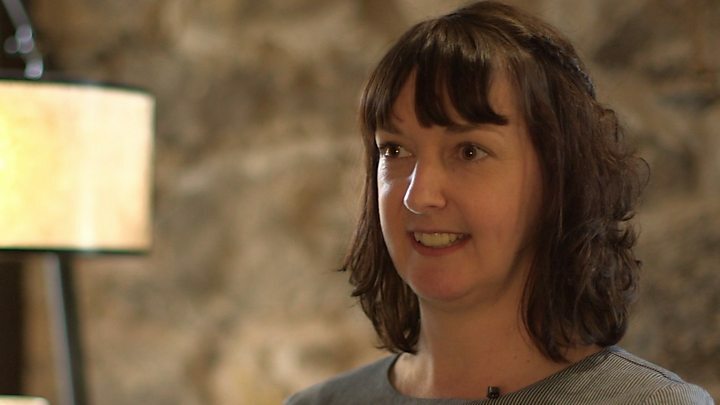 Pauline Cafferkey, the Scottish nurse who survived Ebola, is to return to Sierra Leone for the first time since contracting the disease there. She worked as a volunteer in the West African country, where an epidemic killed almost 4,000 people, in 2014. Her return next month is to raise funds for children orphaned by the disease and people who survived it. Ms Cafferkey, 41, who lives in Glasgow, said the trip would give her "closure in a positive way". She first went to Sierra Leone as part of a team of British volunteers at the Kerry Town Ebola treatment centre. But she fell ill with the disease after arriving back in the UK in December 2014. She recovered, but had a relapse and also developed meningitis, seriously affecting her joints and ability to walk, among other issues. She also had to face a hearing over misconduct charges, of which she was cleared. Ms Cafferkey told the BBC's Victoria Derbyshire programme it would be "psychologically important for me to go back". "That's where things started for me and I've had a terrible couple of years since then, so it'd be good to go back and have things come full circle for me. It provides shelter and education for street children and orphans, and estimates that 12,000 children were orphaned in Sierra Leone by the epidemic. It also says 1,400 of those orphans remain "critically at risk" regarding their health and security. "I'm excited to go back," Ms Cafferkey said. "It'll be great to see Sierra Leone in a different state, and also know that I might be able to help as well. We weren't allowed to travel around it last time." She will also meet other Ebola survivors, but said that, apart from having the virus, "what we went through was very different". "The Ebola patients in Sierra Leone didn't know what they were going home to, or who was left alive in their family. They might be going back to sheer hell." Ms Cafferkey said she now wants to return to Sierra Leone to raise money, rather than simply do fundraising in the UK, because going back is "more personal". Her fundraising efforts will see her run 10k as part of the marathon Street Child organises every year in Makeni, one of Sierra Leone's largest cities, despite still having "little health issues". She is launching an Everyday Hero fundraising page on Wednesday, which is the International Day for Street Children, for the run. "I'm not a runner at all. This time last year I couldn't even run, so it'll be a physical challenge as well as an emotional one. "The temperature will be in the 30s and humidity will be about 90%. "I was in training but I've had to take a week off because my joints are so painful. If I can't run then I'll just walk it. "And if not then someone can push me round in a wheelchair." Ms Cafferkey faced misconduct charges brought by the Nursing and Midwifery Council for allegedly allowing the wrong temperature to be recorded during the screening process at Heathrow on her arrival in the UK. But the charges were dismissed after a hearing was told she had been impaired by her illness. A senior nurse who was found to have concealed Ms Cafferkey's true temperature was suspended for two months, and a doctor was suspended for a month. "I don't hold anything against the Nursing and Midwifery Council," Ms Cafferkey said. "They were purely doing their job. It came at a bad time, it was a massive stress on me when I was already going through a difficult time." She said she had previously felt angry about facing the charges, and feels "disappointed with Public Health England and how they looked after me when I was in Heathrow". After first being diagnosed with Ebola, she spent almost a month in isolation at the Royal Free Hospital in London before being discharged, after apparently making a full recovery. But in October 2015 it was discovered that Ebola was still present in her body, with health officials later confirming she had been diagnosed with meningitis caused by the virus. In the months that followed, her health suffered and she developed problems with her thyroid, hair loss, headaches and joint pains. At various stages she has also spent time in a wheelchair, later using crutches and sticks to walk. She said she once carried a thermometer around with her, in "paranoia" over getting a fever again, a sign of the disease. Ms Cafferkey will be returning to Sierra Leone with two other NHS nurses who also volunteered with her, Sharon Irvine and Alison Fellowes. They all met in that country, have since become good friends, and all three are taking part in the marathon. "We went through everything together," she says. "Treating people there, me getting Ebola twice. I can't think of anyone better to go back with. Ebola brought us together. That's one good thing at least."